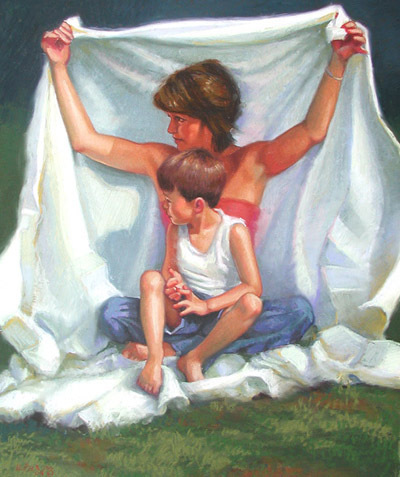 As a mother, former teacher and a professional portrait painter for more than 30 years, it has been my privilege to enjoy the company of children. I see them as fashioned in the image of God and, therefore, of inestimable worth. However, it is impossible to ignore the state of many children in contemporary America. Abandoned, marginalized, used, alienated, neglected, disposable – having become both the abusers and the abused. Currently in progress, the "Endangered Series" consists of works that express my concern for the young. Right, the most recent work in the "Endangered Series": "Abide/Sheltered" - 20" x 24" in pastel. "Today's Text" – 36x60 oil on linen and collage. "Connected Self" – 16x28 oil on linen and collage. A self-portrait project that reflects genealogy study and a welcome link to Puritan ancestors. "Trivialization of God - the Dangerous Illusion of a Manageable Deity" – 48x48 oil on linen. "Floral Cross" – 30x60 oil on linen. "Betrayed" – Each panel of the triptych is a 22x28 pastel. "Chaos to Order" – 4x10 watercolor. This was my page in the Creative Edge Artist Network journal that was mailed from artist-to-artist throughout the United States. "The Cost" – 16x20 oil on linen. "Gospel According to Man" – 16x20 watercolor and collage. "One of a Kind" – 14x18 pastel and collage.